D-STAR (Digital Smart Technologies for Amateur Radio) is a digital voice and data protocol specification developed as the result of research by the Japan Amateur Radio League to investigate digital technologies for amateur radio. While there are other digital on-air technologies being used by amateurs that have come from other services, D-Star is one of the first on-air and packet-based standards to be widely deployed and sold by a major radio manufacturer that is designed specifically for amateur service use. Digital D-STAR signals offer clearer signals and use less bandwidth than their non-digital counterparts. As long as the signal strength is above a minimum threshold, and no multi-path is occurring, the quality of the data received is better than an analog signal at the same strength. 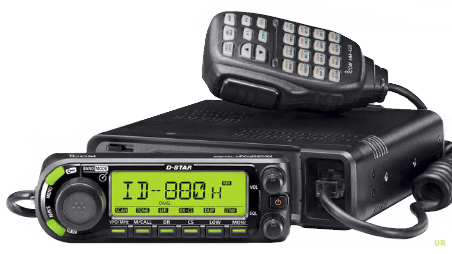 D-Star compatible radios are available on VHF, UHF, and microwave amateur radio bands. In addition to the over-the-air protocol, D-Star also provides specifications for network connectivity, enabling D-Star radios to be connected to the Internet or other networks and provisions for routing data streams of voice or packet data via amateur radio callsigns. The system today is capable of linking repeaters together locally and through the Internet utilizing callsigns for routing of traffic. Servers are linked via TCP/IP utilizing proprietary "gateway" software, available from Icom. This allows amateur radio operators to talk to any other amateur participating in a particular gateway "trust" environment. The current master gateway in the United States is operated by the K5TIT group in Texas, who were the first to install a D-Star repeater system in the U.S.
D-STAR transfers both voice and data via digital encoding over the 2m (VHF), 70cm (UHF), and 23cm (1.2 GHz) amateur radio bands. There is also an interlinking radio system for creating links between systems in a local area on 10 GHz, which is valuable to allow emergency communications oriented networks to continue to link in the event of internet access failure or overload. In addition to using radios, there are two Dongles that you can add to your PC to give you the ability to access and talk on D-Star. The DVDongle and DVDap are discussed below. For D-Star communications, I use the ICOM ID-880H VHF/UHF Digital Transceiver. Another great tool for accessing the D-STAR network when you do not have a radio is the DV-DONGLE. This little device connects to any PC with a USB port and lets you start talking. You still need a valid amateur license to access this network. The DVTool software (for the DV Dongle) and the DVAPTool software (for the DVAP) connect to the D-Star network using an Internet connection. 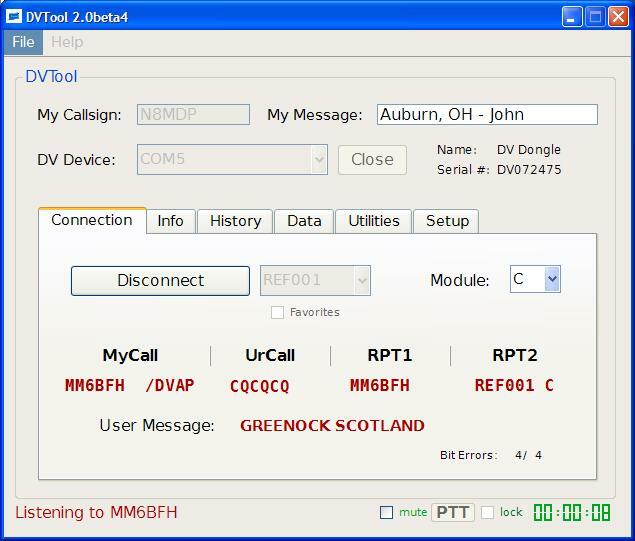 Users may connect to hundreds of D-Star gateways or reflectors and communicate with other amateur radio operators from around the world. Both voice and data modes of D-Star are supported. Some hams use a device called a DVDAP-DONGLE for Digital Voice Access Point dongle. 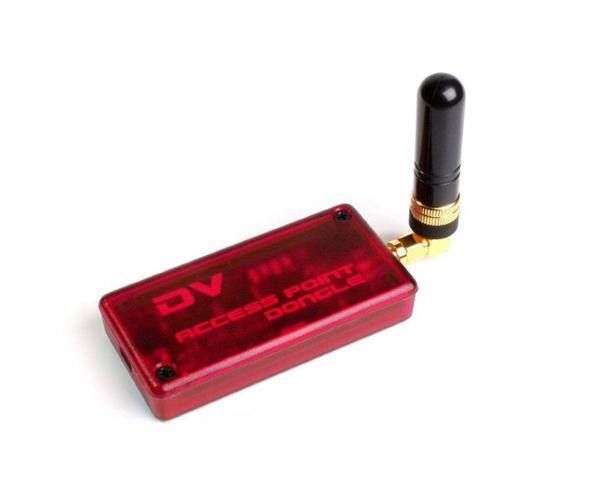 Unlike the DV Dongle, the DVAP allows amateur radio operators to walk away from the computer and transmit/receive D-Star voice and data using a two meter D-Star radio. The DV Access Point Dongle also plugs into a USB port on a PC running Windows XP/Vista/7 or Linux, or an Intel based Mac running Mac OS X. The DVAP is basically a GMSK modem with a two meter transceiver built in. GMSK (or Gaussian Minimum Shift Keying) is the protocol used by D-Star for the RF portion of the network. GMSK is probably best known for use in GSM cellular networks. Using the DVAP hardware (designed by Moe Wheatley (AE4JY) and DVAPTool software (designed by Robin Cutshaw (AA4RC), the frequency agile DVAP is tuned to frequencies between 144 and 148 MHz in IARU regions 2 and 3, and 144 to 146 MHz in region 1. Once the device is opened in DVAPTool, the amateur operator may then walk away from the computer and control the software using a D-Star radio such as an Icom IC-80/91/92 HT. The DVAP has a maximum power output of about 10 dBm (or 10 milliwatts). This gives the unit a range of about 100 yards/meters using the included SMA based antenna. It is possible to extend the range using an outside antenna. The DVAP is designed for use around the house, yard, and neighborhood.